Bhutan recorded the lowest average annual inflation rate in 2018 at 2.69 per cent. It is the slowest increase in the prices of goods and services since the records were maintained by the National Statistics Bureau (NSB) in 2004. Since 2012, when Bhutan recorded the highest average annual inflation rate at 10.92 per cent, the rate has been decreasing except for 2017 when the annual inflation rate rose by more than a percentage point. On the hand, December’s year-on-year inflation rate of 3.13 per cent is one the highest for 2018 with only March seeing a higher rate. December’s increase was mostly attributed to the increase in food prices. Food prices recorded a higher increase for both local and imported compared to the non-food group which increased by 2.65 per cent for both. However, local food prices increased by 4.26 per cent as compared to 3.55 per cent for imported food prices. Among the food items, vegetables recorded the highest rate of increase in December by 3.22 per cent from the previous month. Costs of meat also saw an increase of close to one per cent. Nu 100 in December 2018 is worth only Nu 73 at December 2012 prices. The purchasing power of ngultrum has decreased by 3.04 per cent in the past 12 months due to the price rise in the economy. 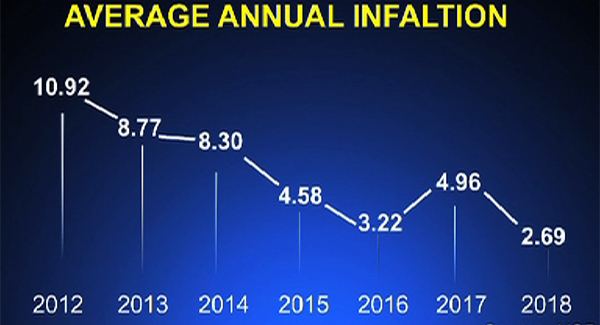 The January inflation rate is yet to be published.